Ryan Pendlebury was named Collingwood's best player for his role of Box Hill and Hawthorn premiership forward Ryan Schoenmakers. Photo: Shane Barrie. 12 is now the magic number of the VFL Magpies after Dale Tapping’s side defeated the Box Hill Hawks by 21 points at Box Hill City Oval. While it has a nice ring to it now, 12 wasn’t as attractive a number early in the final term when the home side took momentum and cut Collingwood’s lead to just goals. A spark was required and the Magpies found it through Travis Cloke. Once again starring at VFL level, the veteran forward missed a chance to seal the game midway through the last quarter before kicking his fourth and final goal to secure the win. Visiting the Eastern suburbs’ home of the Hawks for the first time since 2014, the early stages of the match closely resembled a number of recent Collingwood victories. The Magpies kicked four first-quarter goals and then kept Box Hill goalless in the second term to secure a 27-point lead at the main break. After just three minutes of playing time in the first quarter, Marley Williams was told his afternoon’s work was over. An AFL emergency for Collingwood’s Saturday night clash with the Gold Coast Suns, Williams saw little of the lead his VFL teammates went on to establish. “We had to shuffle a few things around,” coach Dale Tapping reflected. 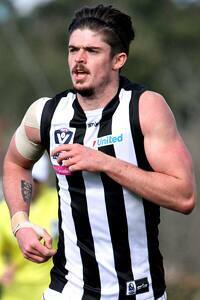 Marley Williams played just three minutes before being removed from Collingwood's VFL team. Photo: Shane Barrie. A challenge came from Box Hill, and it took all of the Magpies’ grit and determination to see it off. “We showed great fight again,” Tapping told Collingwood Media post-game. “We were challenged and I thought we responded really well. A touch of luck helped too. Despite controlling the majority of the play at the Whitehorse Road end, Box Hill kicked 2.6 as it searched for the lead in the final term. It took a 50m penalty to go Collingwood’s way to allow Jordan Kelly to kick a steadying goal that would return momentum the way of the Magpies. The VFL Magpies have been recognised for a number of weeks as a genuine contender, however after now winning 12 games in a row, the stars are aligning. A forward line consisting of Cloke, Mason Cox and Corey Gault would have left any tall defender nervous. Especially when at their feet stand the likes of Jordan Collopy and Adrian Indovino. Travis Cloke and Corey Gault patrol Collingwood's forward line against Box Hill. Photo: Shane Barrie. The duo both kicked majors on Saturday afternoon, with Collopy’s two taking his season tally to 12 and putting him in second position on the club’s goal-kicking leaderboard. In defence the AFL experience of Alan Toovey and Jack Frost shone through, while Kelly and Ryan Pendlebury add a touch of poise and class. Pendlebury had the difficult job of marking Hawthorn premiership player Ryan Schoenmakers, one that Tapping believe was executed successfully. “It was a big challenge for Ryan and I thought he took a step forward today,” Tapping said. Against Box Hill, captain Jack Hellier returned to the midfield to join the ever-improving Matthew Goodyear and always-reliable Brent Macaffer. Jack Hellier avoids Hawk Jonathon O'Rourke in Collingwood's 21-point VFL victory. Photo: Shane Barrie. Ensuring these men get their hands on the ball first was Jarrod Witts. After 59 hit-outs against Port Melbourne last week, the 209cm big man was a towering presence once again on Saturday. He beat Box Hill’s Marc Pittonet in the ruck, while also adding a second-quarter goal and a number of strong efforts around the ground. While each player’s individual storyline remains unique, the path being undertaken by the VFL Magpies appears connected. It’s a path which has just one more roadblock before the VFL finals. The Magpies will conclude their season next week against Footscray at the Whitten Oval. At Box Hill City Oval. Brent Macaffer and Jack Hellier lead the VFL Magpies from Box Hill City Oval. Photo: Shane Barrie.